When I started this project, there wasn’t a website and I didn’t have any business cards. I must admit that I had thought that business cards were a bit of a pretentious waste of time. This is partly because my experience of business cards is that they just sit at the bottom of your bag, or in your pocket gathering dust and you can’t remember why you would want to contact that particular person ever again. I can’t remember a time when I’ve used a business card to contact someone, and when I have needed to find out more about a person or place for most of my adult life I’ve been able to use Google. As I began my fieldwork, I found myself at various ‘expat’ events with a view to finding participants and to publicise the project. In this sort of networking event you need to be able to tell people what you’re doing in less than a minute, because if you don’t grab their attention, the waiter circulating with the tepid cava certainly will. It was at one of these events that I realised the words ‘phd research’ cannot compete with a tray of free plonk, and quickly re-vamped the project with a more catchy name. 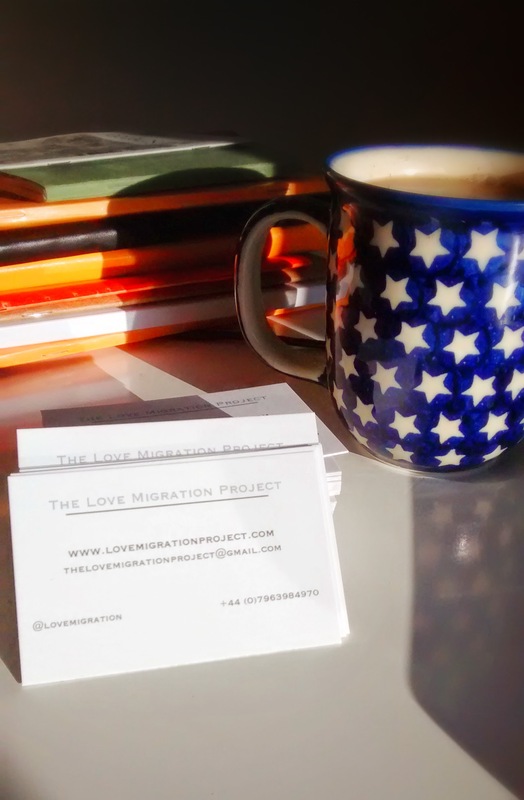 Thus the Love Migration Project was born. What I then realised is that once attention is being paid, there is the possibility that someone might want to know more. Queue Google. I hadn’t anticipated that people would be Googling me to my face, though, but once I realised that this is exactly what was happening, and that they were not impressed with what they were finding, I knew I had better get my web presence sorted out. This blog, still very much in an embryonic form, is one result of that networking encounter, one which I hopefully will serve as a public face for the project as well as a place for people to do an online survey. After that networking affair, I also got some business cards sorted out, which is probably quite useful, but as yet I am still in the process of working out at what point to hand one over.